The Vancouver Condo Buzz » NOW SELLING! Spectacular MODA Burnaby Metrotown Condo Tower > 32 Storey High-Rise Offering 1 & 2 Bedroom Suites + MODA Penthouses! « From Low $600s > Spectacular Lakeside at Sunstone North Delta Executive Townhomes for Sale with 3 or 4 Bedrooms! Imagine living within close walking distance to the entertainment/shopping/dining mecca of the Lower Mainland. Now imagine also living near beautiful city parks and urban green spaces for outdoor recreation year round. Close to the SkyTrain, local services, top ranked schools and much more, the new Metrotown Burnaby MODA condo tower by Polygon is now selling! This beautiful 32 storey iconic tower designed by award winning IBI/HB Architects and is both clean and stylish. The new Burnaby MODA Condos in Metrotown district features both 1 and 2 bedroom apartment residences with open plan layouts. Inside, home buyers will find amazing kitchens with quartz counters and stainless steel appliances in addition to hotel inspired ensuite bathrooms and beautiful floor to ceiling expansive windows with views. The pre-sales Burnaby MODA Metrotown condo tower is unique, artistic and sets a new standard in stylish features and thoughtful interiors. There is also a soothing water feature outside the grand entrance lobby with a dramatic canopy and double over height glass entry doors to welcome you and your guests. 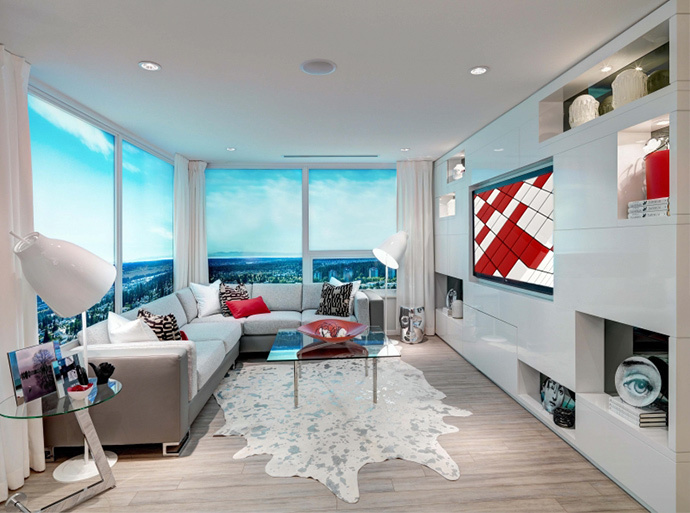 The pre-sales Burnaby MODA Metrotown condo tower will also feature a virtual concierge system. One of the most impressive features is the Polygon master planned Beresford Art Walk alongside MODA Metrotown, a completely redesigned and renovated streetscape graced with paving stone treatments, refreshing landscaping and unique street furnishings. Located along this Metrotown Burnaby Beresford Art Walk is an interactive “art wall” that is exclusively designed for MODA Burnaby condo tower development and features colourful animated images-illuminating inspirations embodying the heartbeat of this exciting city. For more information about the Beresford Art Walk and the MODA Metrotown condos, please visit www.polyhomes.com today for more details and to register your interest. At Moda in Metrotown, residents will have easy access to five star resort inspired amenities by Polygon. You don’t need to leave home to enjoy over 1,900 square feet of private onsite amenity spaces exclusive to Moda Metrotown condo residents only! The Moda Fitness Studio will feature a completely air conditioned workout facility that has both cardio and weight training equipment. There’s also a TV and a yoga/stretching area. 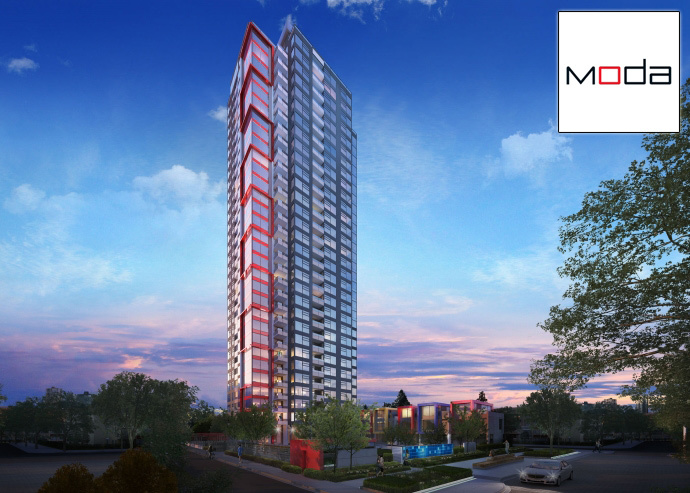 As well, the Moda Metrotown Burnaby condos will have a central lawn green space for you to read a book or socialize. The indoor social lounge will feature a pool table and comfortable seating, which is great for entertaining friends and family. 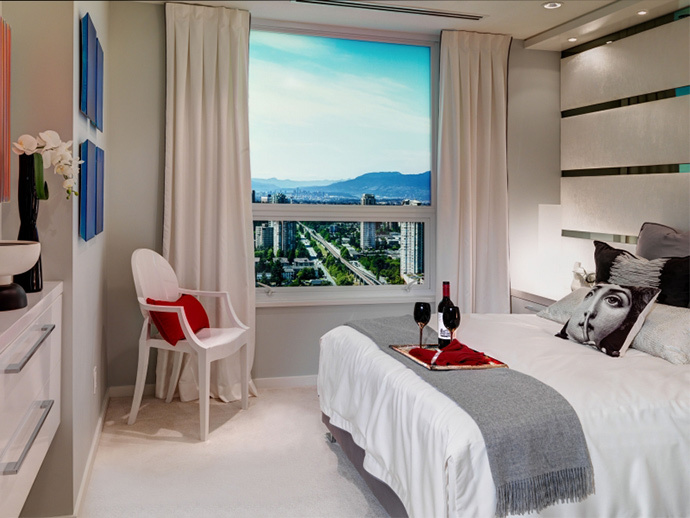 The new Metrotown Moda Burnaby condos will also have a resident manager and a virtual concierge. The building itself is completely secured by key fob access. There is a bright and well lit underground parking garage in addition to elevators with secure lock-off control access to each floor. All front doors have deadbolt lock hardware. The Moda Metrotown condos will also feature new generation rain screen glazing system, fire sprinkler systems and the Travelers Guarantee Company of Canada home warranty for all new homebuyers. Custom options for your new home at Moda Burnaby condos include a wireless security system and storage lockers. 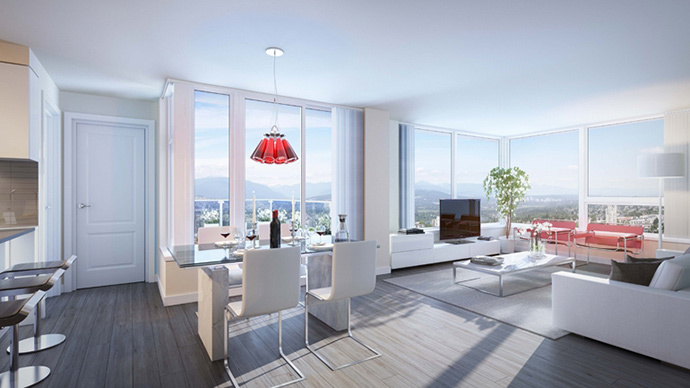 Special Burnaby Moda Penthouse features on floor 37 include over height 9 foot ceilings and fully air conditioned homes for year round comfort. Here are the four featured draft Moda floor plans. The new Burnaby Moda floorplans are subject to change at any time. In addition, these four draft Moda floor plans only represent some of the many layouts available at this project. Please see a sales representative for more information. The entry doors feature contemporary richly stained wood and polished chrome hardware. In addition, the interior doors are carerra style with two panels and modern hardware. The bedrooms have cut pile carpets, thick and rich underlay and the entrance, den, kitchen, living/dining has durable wood style laminate flooring. The Moda Metrotown Burnaby condos also feature 3 colour schemes that include: Milanese Sunset, New Yorker Night and Parisian Snow. The expansive windows are floor to ceiling and they also have custom fit vertical blinds for extra privacy. The windows are also low E glazed for energy efficiency. 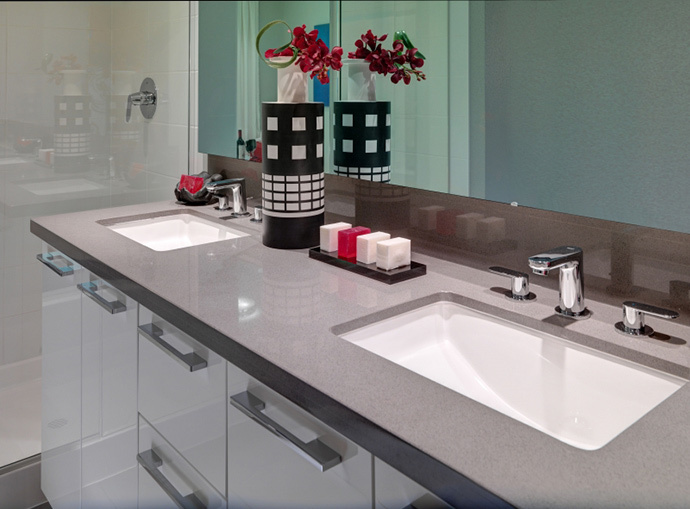 The spa inspired bathrooms the presale Burnaby Metrotown Moda condos include oversized vanity mirrors and recessed task lights, ensuites with quartz counters/backsplashes, flat panel wood veneer cabinetry with polished chrome pulls and elongated profile water closets. As well, the toilets are dual flush and the fixtures and polished chrome and European inspired. All showers and tubs are equipped with oversized rain shower head on a contemporary straight arm. The presale Burnaby Metrotown Moda condo kitchens exude modern elegance with stunning quartz counters and large format glass tiled backsplash. Also, there are stylish and contemporary flat panel wood veneer o high gloss white cabinets with designer selected polished chrome pulls for the lower cabinets. There is a European style single lever faucet, lower cabinets with two bin recycling station, slek recessed lighting, soft close cabinet hardware and seamless under mounted Faber hoodfan. There is also a stylish Fagor or Blomberg fridge with bottom mount freezer that’s seamlessly integrated. 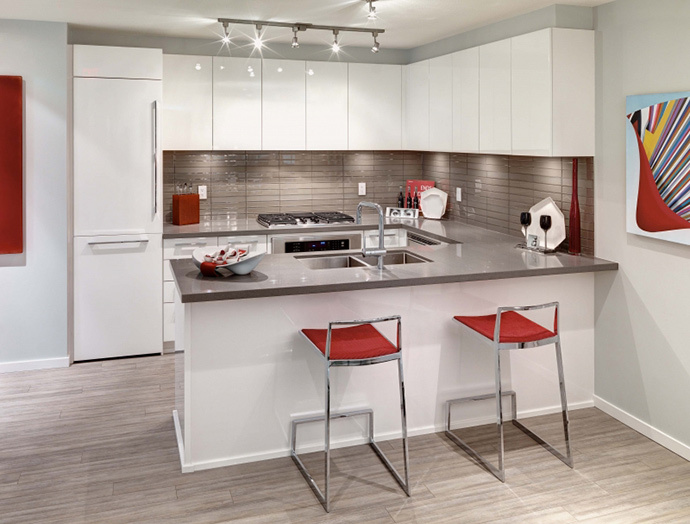 The presale Burnaby Metrotown Moda condos will also feature an impressive KitchenAid appliance set in stainless steel finish that includes a four burner gas cooktop, self cleaning electric wall oven, microwave and dishwasher. All homes at Moda Metrotown will come with stacked washer and dryer. The condos are brought to you by Polygon Moda Tower Ltd.